During a presentation Monday, the Delaware County Auditor’s Office received an award from the Ohio Auditor of State’s Office. Pictured, left to right, are Commissioner Barb Lewis, Dawn Hall (county auditor’s office), Tim Kraft (state auditor’s office), Delaware County Auditor George Kaitsa, Jane Tinker (county auditor’s office), and commissioners Gary Merrell and Jeff Benton. 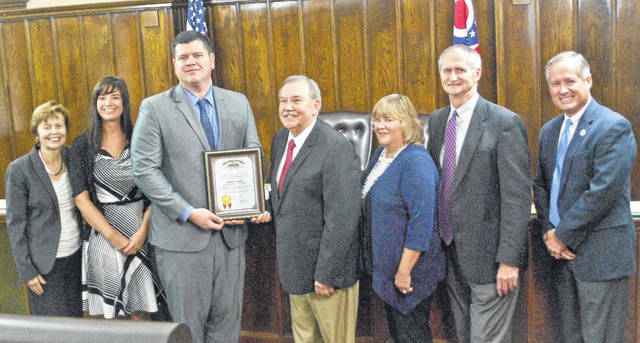 Delaware County Auditor George Kaitsa was presented with the Ohio Auditor of State’s highest award Monday during the Delaware County Board of Commissioners meeting. Tim Kraft, a regional representative with the Ohio Auditor of State’s Office, said when Dave Yost, a former Delaware County prosecutor, took office as Ohio auditor of state, he saw the importance of publicly recognizing excellence. Kraft said the award is given to those entities who file timely financial reports with the Ohio Auditor of State’s Office and have a clean audit report containing no findings recovery, material citations or weaknesses, no significant deficiencies, no findings or questionable costs. He said the list of requirements is a lot of auditor’s speak, so he broke it down into simple terms for those in attendance. Kraft then presented the award to Delaware County Auditor George Kaitsa and his staff, Dawn Hall, senior accountant; and Jane Tinker, director of the fiscal services. “I’ve said it before and I’ll say it again, I don’t think any county in the state has a better county auditor than we have,” said Commissioner Gary Merrell. Commissioner Jeff Benton added he has been an auditor and understood the challenges of the county auditor’s office. With that in mind, Benton said he appreciated the culture of excellence that had been created in the auditor’s office. Commissioner Barb Lewis said she thought “it’s just a wonderful honor” for Delaware County Auditor Kaitsa and his staff to receive the award. “I would like to thank Auditor Kaitsa and his staff for all the wonderful work,” she said. This entry was tagged Barb Lewis, D. Anthony Botkin, Dave Yost, Delaware County auditor, Delaware County Commissioners, Gary Merrell, George Kaitsa, Jeff Benton, Ohio Auditor of State, Tim Kraft. Bookmark the permalink.